Federal Transit Administration safety inspectors note other parts of the Metro system facing similar water issues, including portions of the Red and Blue Lines. WASHINGTON — The water that burst through the side of the Yellow Line tunnel outside L’Enfant Plaza Thursday is believed to be groundwater, a Metro spokesman told WTOP. The tunnel south of the station, where deadly smoke filled a train in 2015, passes under the Southwest Waterfront. In documents released Friday, however, Federal Transit Administration safety inspectors note other parts of the Metro system facing similar water issues, including the Red Line near Bethesda, Friendship Heights and Van Ness, as well as the Blue Line between Addison Road and Capitol Heights. Federal inspectors note a number of areas where the tunnels are still too dark for the safety of workers or people who might have to evacuate. Lights are either covered in grime or burnt out. 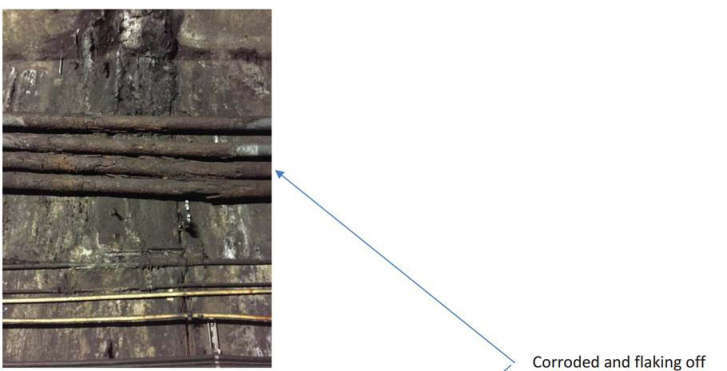 Between the Dupont Circle and Farragut North stations, an inspector found “extensive corrosion” that could lead to metal chipping off and hitting the electrified third rail. Between Stadium-Armory and Minnesota Avenue on Jan. 31, inspectors found a significant amount of water sitting along the tracks. On the Orange, Blue and Silver line tracks downtown Jan. 18, an inspector found water leaking onto the elevated walkway used to evacuate trains. Water leaks also contribute to electrical arcing incidents, and the FTA has urged Metro to address the issue. Along the Red Line, a dedicated crew works most nights to clear drains and clean up.